Music and visual art are two ways artists express themselves. Infusing the two together is Monaco-based Brazilian artist Marcos Marin, whose artworks display both the iconic status of the subject he portrays and the rhythm and beats of the music that inspire the work itself, giving rise to a sense of movement to both his 2D and 3D op art. David Beckham, 2014, Acrylic on canvas, 130x130cm. All images courtesy of Gallery Elena Shchukina. His first solo exhibition in London is hosted by Gallery Elena Shchukina this spring. Entitled ‘Icons‘, his show displays sculptures and paintings of media and culture legends from silver screen sirens like Grace Kelly and Marilyn Monroe to contemporary figures like David Beckham and F1 driver Alain Proust to political figures like Mandela and Ghandi to leading figure in art like Andy Warhol, Dali and Picasso. The simplicity of Marin’s works and the manner they interact with the viewer on different levels only accentuate his talent, technique, and confidence. Left: Dali, 2013, Plexiglass sculpture, Edition of 8, 60x48x18cm. Right: Grace, 2013, Plexiglass sculpture, Edition of 8, 70x46x18cm. Exhibited at the show space are also furniture pieces that casted away the sterile atmosphere all too familiar to art galleries injecting a sense of completeness. 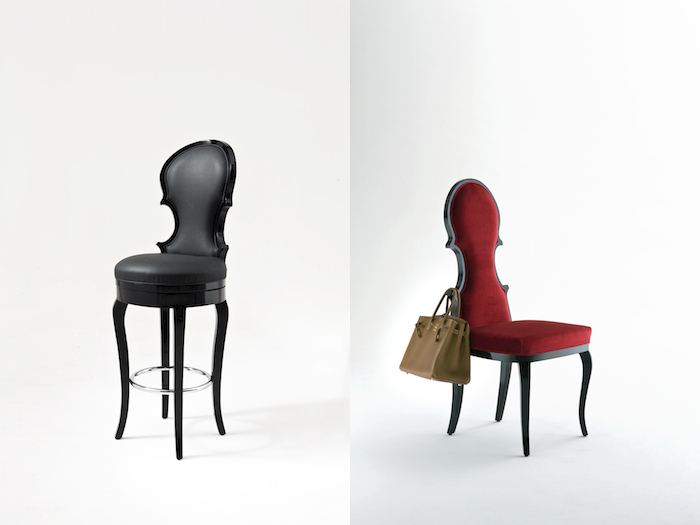 Appreciated worldwide as ‘a gem of Italian high end furnishing’, Colombostile created chairs and bar stools combining luxurious finishings and whimsical designs inspired by the slithering silhouette of the violin. Complete with carvings of the musical note symbol on the back of the chair, these furniture pieces sing with unfailing musicality. Furniture by Colombostile. Left: Bar stool, wood structure, gloss finish. Foot rest in polished metal. Upholstered in leather. DxH 44×120 cm. H. seat 75 cm. Right: Chair, wood structure, gloss finish. Upholstered in cotton velvet. WxDxH 52x59x114cm. H. seat 49cm. ‘Marcos Marin: Icons‘ is exhibited now till 28 March 2014 at Gallery Elena Shchukina‘s second space, 18 Beauchamp Place, Knightsbridge, London SW3 1NQ.